Grind and Brew Coffee Makers – from bean to cup in one process. 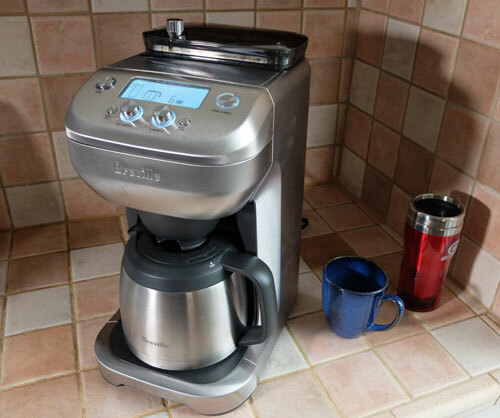 The Breville Grind Control grind-and-brew coffee maker. What are grind and brew coffee makers? They are coffee brewers which also include a grinder. You simply fill the reservoir with water, add whole beans to the grinding basket and press the button. The beans are ground and immediately after, hot water drips through the grinds and your fresh coffee pours down into the carafe. First, you save on counter space, as the grinder is included with the brewer. So there is just one machine to deal with. Second, the water dips through the coffee grinds immediately after grinding, so you are assured there will be no loss of flavor between grinding and brewing. Third, there’s a lot less mess when you make a pot of coffee. No spilled beans. No ground coffee on the counter. Not wet and messy paper filters. And so on. The choices are a little limited, but there a few to choose from. Here at Coffee Detective we use the Breville Grind Control brewer you see pictured enough. You can watch our video review of the Breville brewer here.